"A highlight of the upcoming Sengoku Basara: Judge End will be that the anime combines new elements with the intense drama from the original game. There's Date Masamune and Sanada Yukimura, with the score they both want to settle, and then there's Tokugawa Ieyasu - who seeks to unify the country with the power of bonds - and Ishida Mitsunari, who has sworn to get revenge on Ieyasu. The feelings of these four men will cause many more warriors to become involved as they head towards Sekigahara. What kind of outcome will this magnificent drama hold? Since this is a series which both fans and first-time viewers can enjoy, please check it out." Now that I have the magazines in my hand the anime feels closer than ever. 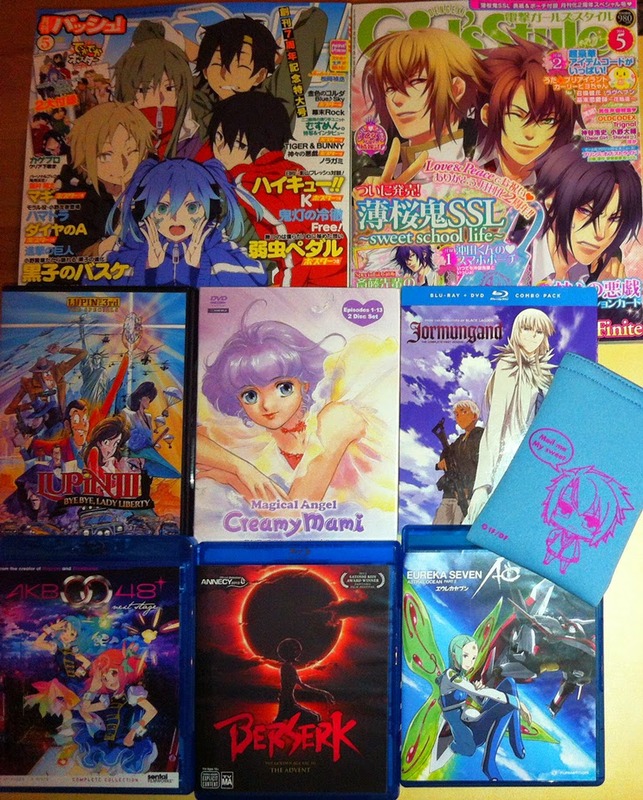 It looks as though this month's anime magazines are going to be confirming more details properly - hurrah! The other six items are all US Blu-ray/DVD imports from Amazon USA. The package contained Lupin III: Bye Bye Lady Liberty, Magical Angel Creamy Mami part 1, Jormungand, AKB0048 Next Stage, Berserk: Golden Age Arc III - The Advent and the second half of Eureka Seven: AO. A nicely diverse selection of titles to keep me entertained on this bank holiday weekend. The next picture shows the smaller items. Now that I've got a solution set up for light PC gaming it seemed sensible to pick up the first Dot Kareshi (We're 8-bit Lovers!) CD/game pack. It's becoming a little annoying to find these days, which could mean that it's heading out of print for the time being. It's been a while since I played a game which didn't involve death and sadness so it might provide a pleasant change of pace. 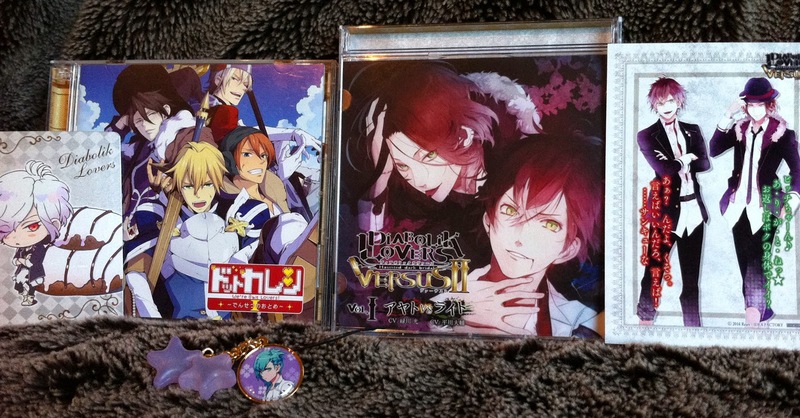 Joining it is the first of the new Diabolik Lovers 'Versus' CDs featuring Ayato and Laito. The content had been spoiled quite heavily for me by fan discussion before it arrived, but it was still worth every penny for over an hour of vampires and dummy head microphone recording. It came with a bromide of the two brothers and a randomly packed trading card of Subaru. Why do I keep getting Subaru goodies lately? The last item is a freebie for ordering the two magazines above from Yesasia - a 'frosty candy mascot' strap featuring Ai from Uta No Prince-sama.